Saw this list on my friend Michelle's blog (Texas Tanners) and decided to share my own answers. 3. Colored lights on the tree/house or white? White for me. My husband would like colored lights, but I've convinced him to use white for 15 years, so I think I've won that battle! 4. Do you hang mistletoe? No. One year I made a kissing ball, but didn't make it very well, so it kept falling apart. 5. When do you put your decorations up? I used to do it right after Thanksgiving, but now that I have a daughter with a Dec 2 birthday, we wait until after her party. 6. What is your favorite holiday dish? My Aunt Jane's cranberry salad. I don't remember ever having it until about 5 or 6 years ago, but I fell in love. I've made it for Thanksgiving and/or Christmas every year since. 7. Favorite Holiday memory as a child? Until I was 12, both sets of grandparents lived in the same city (about a 4 hour drive from our home). We alternated which ones we stayed with each year. We would open presents with my dad's family on Christmas Eve and with my mom's family on Christmas morning. We got to see all the aunts, uncles, and cousins. I think spending time with family is such a big part of the Christmas season! 8. When and how did you learn the truth about Santa? Fourth grade in the cafeteria lunch line. My best friend, Laurie, had a sister who was 4 years older than us, so she always found things out before me. She spilled the beans to me, but I got to "keep believing" since my brother (5 years younger) was still a believer. 9. Do you open a gift on Christmas Eve? Nope. Although I have nothing against it. 10. How do you decorate your Christmas tree? White lights, wooden cranberry bead garland, ribbon bows, and completely random ornaments. My favorites are the ones we buy when we travel or to represent something special for that year. When I get them out each year, I remember the wonderful times from years past. This year's ornaments are from the Houston Zoo (had our 1st season pass this year), Sea World, and Universal Studios Orlando. 11. Snow! Love it or Dread it? How about don't even get it! 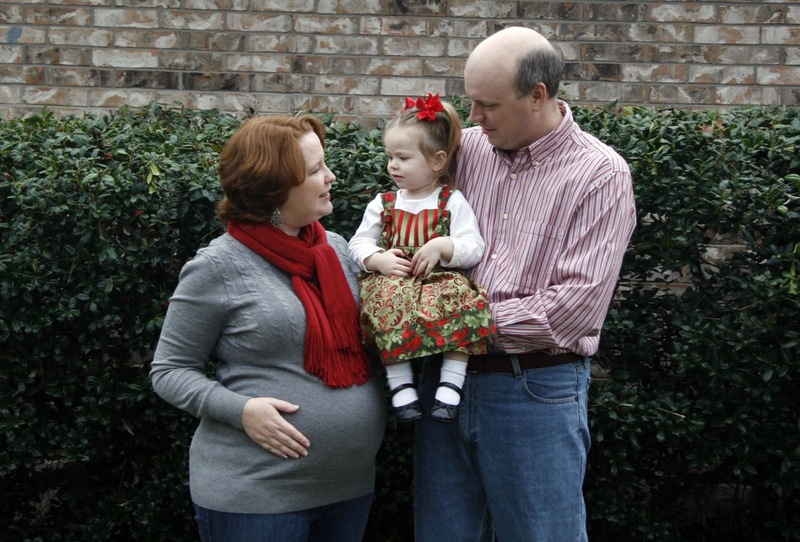 Well, I take that back - our last snow in Houston was Dec 4, 2009, the day we brought Annelise home from the hospital. It hadn't been cold enough very long, so nothing stuck, but it was nice to watch out the window. We actually had a white Christmas in 2004. It snowed on Christmas Eve, so we walked around outside while it was falling around midnight. The next morning, there was actually a little bit left on the grass, but it melted in the sun by mid-day. Not sure I would actually want to live where it really snows, but it's nice to have a glimpse now and then. 12. Can you ice skate? It's been a really long time. I used to roller skate all over the neighborhood as a child, and would go ice skating whenever we visited my grandparents. But the last time I tried was in college over 15 years ago, so I'd be a little scared to try at this point. 13. Do you remember your favorite gift? Fourth grade - Cabbage Patch Kid. Yes, that's also the same year I found out Santa wasn't real, but he still delivered! That's about the only time I ever got the gift that was all the rage that year. 14. What's the most important thing about the Holidays for you? Spending time with family and friends, being part of all the festivities at our church, and remembering that Jesus is the reason for the season. 15.What is your favorite Holiday dessert? My mom's fudge. Yummy! 16. What is your favorite holiday tradition? Reading the Christmas story from Luke 2 before opening Christmas gifts. We always did this with my family growing up, and I'm proud that it's a tradition with my in-laws, too. When our girls are older, we are planning to each year spotlight a different country our families came from. Hopefully that will include traditions, decorations, and food. Since we have a 2 year old and one on the way, it will be about 4-5 years before we begin, but it's fun to dream about now. 17. What tops your tree? A gold, glittery star. 18. Which do you prefer: giving or receiving? Am I incredibly shallow if I say both? I love to see someone's eyes light up when I give them something they want or really like. But I also like to be reminded that people love & appreciate me, too! 20. Favorite Christmas show? Old: The classics I'm getting to introduce to Annelise like Rudolph, Frosty, & Charlie Brown; White Christmas; It's a Wonderful Life. New: The Santa Clause series and Elf. 21. Saddest Christmas Song? I'll Be Home for Christmas (because it might be "only in my dreams"). 22. What is your favorite Christmas song? O Holy Night. My favorite version is by Point of Grace. I hope my list has made you reminisce about some of your favorite Christmas moments. Merry Christmas from Julie, Annelise, & Eric!